Our website http://www.fishingkites.co.nz is being updated daily. To ensure you are getting all the latest information use the refresh button when you logon to the site. Due to everyone at Paul's Fishing Kites being run off their feet filling orders, we have been unable to bring you this newsletter until today, Saturday. Apologies to everyone. We hope you enjoy the pics and we look forward to your beach reports coming in over the next week. 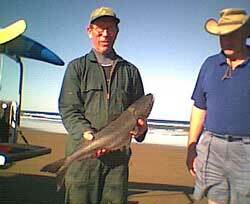 There are reports of good fish being caught around the northern coast. So get your gear out and go fishing! It looks like the winds will be light southwesterlies over the whole country for today and tomorrow. A great opportunity to get out on the east coast and catch some of the bigger snapper that are being caught off Omaha. Here is an excellent shot of a great catch! It includes all the attributes we are looking for in a photo for our annual contest. Unfortunately, when our computer crashed last month we lost the details that go with it. The pic is taken at an interesting angle, (or by a very tall kitefisher). If you recognise the person in the pic or know a 9 foot tall kitefisherman / photographer, please let us know who they are. We can then get in touch with them and find out the catch and area details. The photo is in the draw for the monthly prize of a $30.00 voucher for the best photo submitted for our weekly newsletter or NZ Fishing News Kite Report. Thanks for the $30.00 photo prize I received this week. I have already cashed in my last one and am planning my next purchase, great timing. Not much to report as the wind hasn't been what I like for kite fishing. I have also been too busy. However, I am using the time to fill up on bait. I am putting the net out for kahawai and mullet on most tides and catching plenty of fish. One tide recently returned enough fish to fill three containers. That's 147 strip baits, plus I kept three of the best fish for the smoker. It has become a daily routine as every morning and late evening, or on the drop of the tide I check out the net. It's only 200 metres from my shed to where I put the net out, so not far to go and catch bait or a couple of fish for the smokehouse. I see the kowhai trees are in flower now, this is great news for Northland kite fishers. 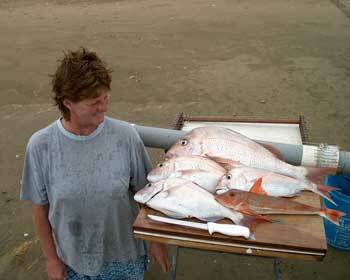 It is about this time of the year the large snapper are caught up here on the west coast. Last year, after the kowhai started flowering there were over eight XOS snapper caught in a week. All weighed over 20 pound and were caught between Glinks Gully and Baylys Beach. David Billings from the Kite Fishing Club and I were out fishing this time last year and he landed a 24lb snapper. My kahawai baits were the flavour of the day and now my freezer is full it is time to get out and use them. Come on the northeasterly winds! Alic McGregor with his kahawai on Porangahau Beach. Alic McGregor was using Target Snapper Hooks baited with squid. Alic has an electric kontiki rig which he uses on the beach. This fish was caught on the first set of the day. Rodger Gardner with 3.02, 2.58 & 2.2kg. D Hall with his 1.8kg kahawai. This is the first fish D Hall has ever caught and he was a very happy. Last weekend was very busy on the beach as the sea was flat and about 15 knots of westerly wind with a slight northerly rip. Kite fishing is becoming very popular in this area and there were a few people on the beach trying out their new Paul's Fishing Kite Rigs. Some with Dropper Rigs and others with the Bottom Longline Rigs. It was great to see the first time kite fishers having a successful days fishing. Overall the kite fishing has been very good. Doug Bassett called on Monday morning to report that he caught 18 big gurnard, two kahawai, three skate and four red cod. All of these fish were caught on Sunday from his Bottom Longline Rig. Trev Sciascia has been out kite fishing and came back with four gurnard. Rodger Gardner caught 10 kahawai and one gurnard last time he was fishing. It is obviously still a bit cold for the snapper as there have been no reports of any being landed yet. We are hoping for another good week with more of this sort of weather. If you are in the area call in, have a chat and check out our range of Paul's Fishing Kites Rigs, Kites and Target Snapper Hooks. As predicted last week, the snapper are coming down the coast. Reports from Rob at the shop indicate good sized fish are being caught in 30 metres of water off Omaha. One of the locals has been setting his Boat Longline out off the beach and catching his limit of snapper every time. This is great news for those fishing north of Auckland. Those that took advantage of the northwesterly winds last weekend did well fishing in the Hauraki Gulf. This weekend is excellent for kite fishing on the east coast. Excellent news from the Manukau Harbour. The trevally are now in the upper harbour. My partner Mark went out for a couple of hours last weekend and came home with a couple of sacks full of good sized trevally. I can't wait to get out there myself and catch a few. Pipis or any shellfish bait work best when targetting trevally. I use the 4/0 Target Snapper Hooks for the trevally and gurnard we catch in the harbour. Now is the time of year to be checking your kite fishing gear. The fish are coming in and you want to be catching them. Do your maintenance at home so you maximise your time on the beach. Check your knots, crimps, joins, clips and mainline. Simple things like washing down your trace rack with fresh water when you get home from the beach will remove the salt from your traces. Salt is anhydrous (draws moisture out of the air) so it is better to wash and dry your traces so electrolysis does not blunt your hooks between trips. We have had very few Beach Reports sent in over the past week. Without these we have very little information to put into this newsletter. Please take a couple of minutes to fill out the form and let everyone know what fish are out there.